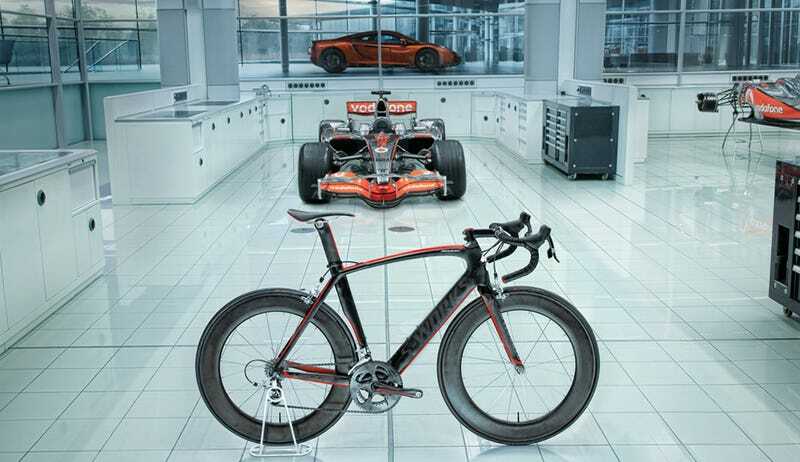 Bike company Specialized has worked with F1 racers McLaren to come up trumps with the McLaren Venge road bike, which will be used this weekend in the Milan-San Remo competition by Mark Cavendish, who won back in 2009. As you can probably tell, Specialized is asking quite a bit of moolah for this one—over $8,000, in fact, though I'm reliably informed that that's not bad for a bike of this caliber. That's for the McLaren Venge, which will be available in September, but there'll be a cheaper one out at the tail-end of April, called the S-Works Venge.